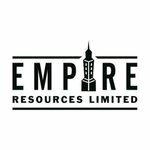 Empire Resources (ASX: ERL) is getting set to evolve from a developer into a producer at its WA gold project, Penny’s Find, situated around and within world famous goldfields surrounding Kalgoorlie and Coolgardie. This sub $10 million capped company is expected to commence mining this month after building a crucial new public road around the mine, completing the dewatering dam and office infrastructure, and clearing waste top soil which will be used later to rehbilitate the mine waste dumps. Following a recent $2 million capital raise, and having already secured $7.5 million in mining funding (repayable within 7 months) to go towards Penny’s Find and its Yuinmery Copper/Gold Project, the company is now ready for an assault on its gold production ambitions with its first target to produce 100,000 ounces. ERL expects its first gold pour within 4 months and have its $7.5 million mining services contract funding paid off within five months. Penny’s Find, which is the subject of a JV of which ERL owns 60/40 with Brimstone Resources, has a lot going for it. Its open pit reserve is 21,700 ounces and requires a CAPEX of just $1.5 million, with a circa $5 million CAPEX for further underground development. Furthermore, the system remains open at depth, with an Underground Feasibility Study already underway to complement the Bankable Feasibility Study based on the open pit. With all that, a steady stream of news flow is likely over the coming months as the company begins large scale mining and gold production. It should be noted though that the company is in the early stage of this development, so investors should take a cautious approach to their investment decision in this stock and seek professional financial advice. 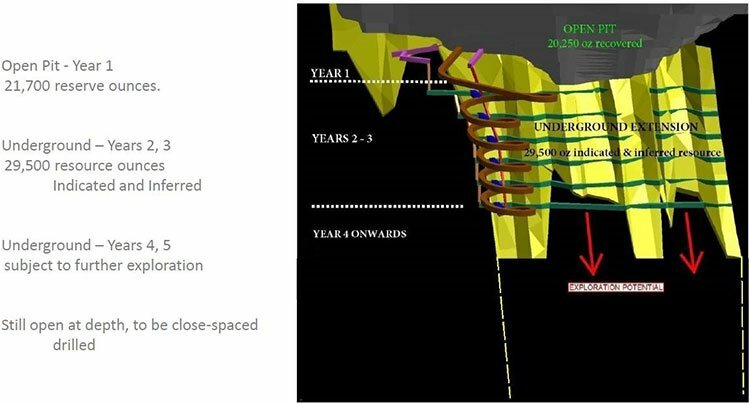 Beyond open pit mine start up, a total of six drill holes are planned around mid-year to convert Inferred into Indicated Resources. Down the track, ERL will look to process on site, as the company looks to purchase its own infrastructure rather than rent, which would improve the long term economics. So, Penny’s Find could provide a significant, low cost starter mine for ERL, however the company also has a couple more cards up its sleeve. Firstly, it will begin drilling the A Zone at its 100% owned Yuinmery copper-gold Project, in order to define a Maiden Resource. Secondly it is looking at other gold deposits to add to its stable to beef up its expected overall resource. In January, ERL entered into a two-year Option agreement to acquire two nearby prospective copper-gold licenses also in WA... an acquisition that would extend ERL’s already impressive portfolio, given the company is capped at only $9.6 million. We see a lot of up and coming gold producers at The Next Small Cap, but a company at development stage really needs a good strategy to bring its ambitions home. Empire Resources (ASX: ERL) certainly has a solid strategy as it looks to move from developer to producer in a matter of weeks at its Penny’s Find Gold Project in WA, prove up its Yuinmery Project and join the ranks of some of the bigger companies operating in similar WA territory. There are a plethora of ASX listed gold producers faring quite well right now on the market, all capped at many multiples of where ERL currently sits – and given ERL is about to go into production, there is a strong chance for a share price uplift, given its current $10 million valuation. When we last covered the stock in October last year in the article Path Cleared for ERL’s WA Gold Production: Begins Next Quarter , we looked at how ERL had brought the project to its advanced stages with only infrastructure work to do. We also looked at its shallow, high grade gold results. Now, the infrastructure work is done and ERL is ready to produce the golden goods. Following the completion of a crucial road re-alignment, and with site earthworks now finalised for site offices, workshops, a dewatering dam and water supply, Penny’s Find is ready to mine, with full scale mining operations to commence on schedule just weeks from now. It’s also worth taking a brief history lesson on the performance of the gold price in the first year of a US presidency – you can see in the chart below that the gold price performs remarkably well in a president’s inauguration year. With President Trump now calling the shots in the White House, and global uncertainty seemingly on the rise – who is to say where the gold price will end up one year from now? At the same time, like all commodities, we should point out that the gold price can also go down just as easily – always take a cautious approach to any investment in any gold stock. Given ERL’s ore reserve has been calculated at a gold price of AU$1500 per ounce using a lower cut-off grade of 1.41g/t Au, ERL finds itself in a strong position as it moves to begin production. This is especially true when you have a look at the excellent exploration potential on existing targets. But before ERL chases those exploration leads down, the company remains to be on track to be producing in a highly prolific gold region with access to a Resource of 470,000 tonnes @ 4.42g/t and is about to go into production with a market cap of just $10 million. Based on the numbers, could ERL be ripe for a re-rate once production kicks into gear? It certainly has everything moving in the right direction. In March this year, ERL announced it had secured $7.5 million in funding via a binding Term Sheet with Blue Capital Services Pty Ltd. 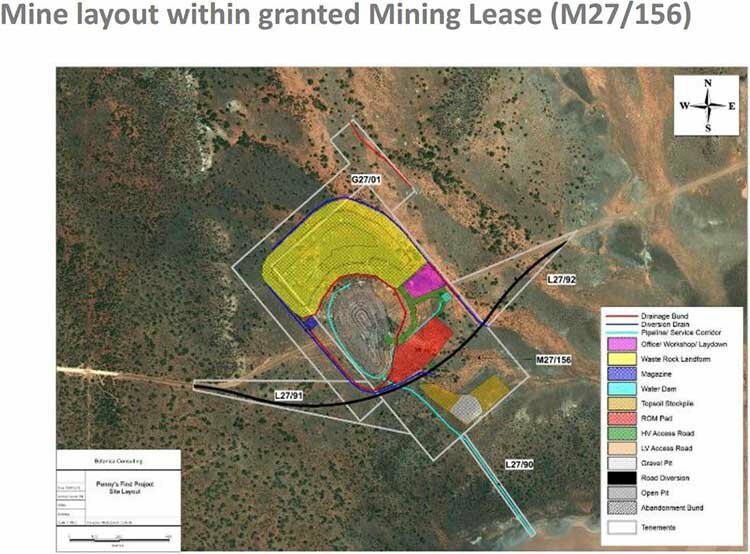 The deal stipulates that Blue Capital will fund mining and related costs – to a maximum of AU$7.5 million – seeing it into full production and until the project is cash flow positive. Furthermore, Orionstone, one of Australia’s larger privately owned mining fleet operators and suppliers, is providing equipment and services for the open pit mining operations at Penny’s Find. The agreement ensures the Penny’s Find Gold Project marks the point where all required agreements for mining, haulage and treatment of Penny’s Find gold ore are now finalised. The funding from Blue Capital will be repayable within 7 months of mining commencement. The agreement covers the mining operations of the open pit only, and is subject to the signing of a formal mining services agreement, and ERL funding its own corporate overheads. Other contracts recently confirmed by the company include Kalgoorlie’s Hampton Transport Services for haulage, and Golden Mile Milling Pty Ltd, whose Lakewood Mill on the outskirts of Kalgoorlie, 63 kilometres from Penny’s Find, will process the ore.
Just as it starts its maiden mine, ERL is also undertaking underground mining studies on the Penny’s Find deposit to suss out the ability to extend the project’s mine life through a new underground mining operation following open-pit mining. ERL’s optimism for the underground mine potential is backed up by a JORC Indicated and Inferred gold resource of 170,000t @ 5.40g/t Au beneath the planned pit floor. A preliminary underground mine design was done fairly early on, to ensure it could work in smoothly with the operation of the primary open pit mine. You can read the full executive summary from MineGeoTech on ERL’s website . The bottom line is the results of the study point to a possibility of extending the mine life by 3+ years. While the focus is on Penny’s Find and its ascent from development to production, ERL’s second project, the Yuinmery Copper-Gold Project also holds a lot of weight. 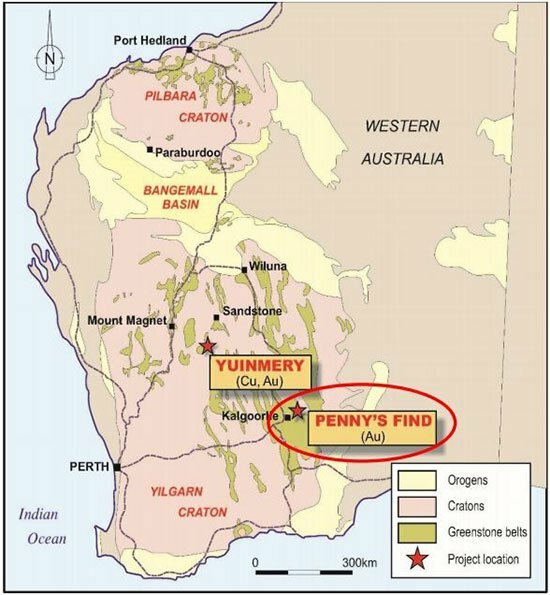 Situated just 475km northeast of Perth, Yuinmery lies within the Archaean Youanmi greenstone belt and ERL is exploring for volcanogenic massive sulphide (VMS) copper – gold deposits. 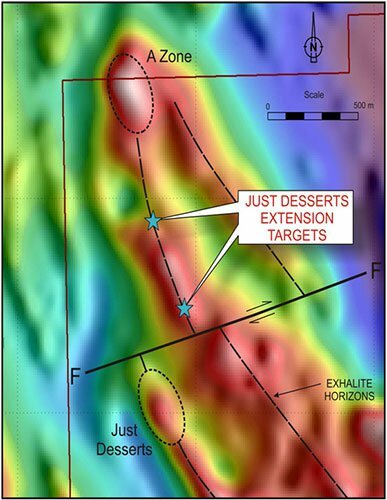 ERL holds a 100% interest in a group of tenements at Yuinmery which contain several occurrences of VMS mineralization, including the Just Desserts prospect, where ERL has defined an Inferred and Indicated resource of 1,070,000 tonnes at 1.82% copper and 0.78g/t gold. Importantly, Yuinmery is similar in nature to orebodies currently being mined at Golden Grove and Jaguar in Western Australia. 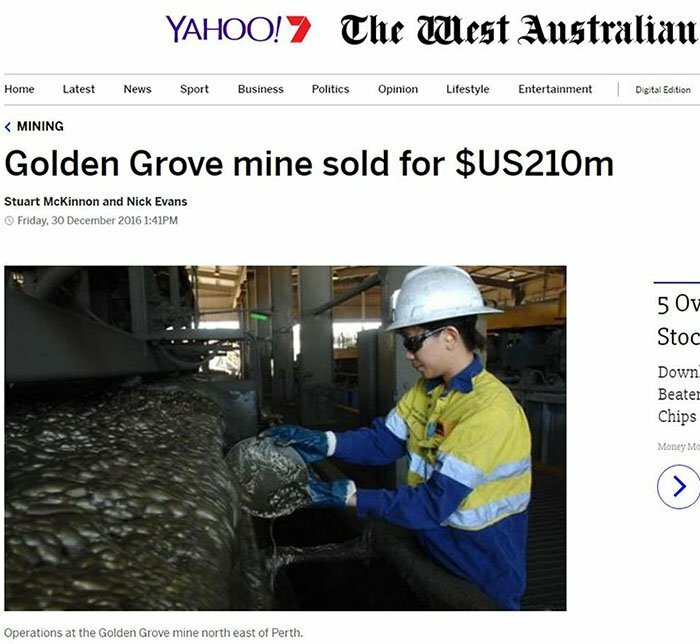 Golden Grove was a company maker for Chinese ASX listed MMG. The $129 million capped company sold the mine for AU$290 million to private equity outfit EMR Capital. Deposits of this style of mineralization commonly occur in clusters and have been mined to great depths, hence why the $2 billion capped Independence Group (ASX: IGO) continues to go deeper at its 100% owned Jaguar mine. ERL is hoping to follow in its neighbours’ footsteps and if the results are half as good, it would justifiably anticipate a significant increase in investor interest. Metallurgical testwork indicates high recoveries of gold and copper may be expected from the treatment of the Just Desserts mineralization – so this is a project we will be keeping an eye on. Showing its commitment to building its namesake, Empire entered into a two year option agreement in January to acquire an interest in two copper-gold licences in WA from Evolution Mining. The two granted exploration licences, E57/681 and E57/1027, are on the northern boundary of ERL’s wholly-owned Yuinmery copper-gold project. The licenses include the significant A Zone copper-gold prospect which lies on the northern boundary, as seen below and would extend Yuinmery’s boundaries. With funding, as well as anticipated near-term cash flow from mining, it’s no wonder ERL would be looking towards new exploration targets to maximise its position. 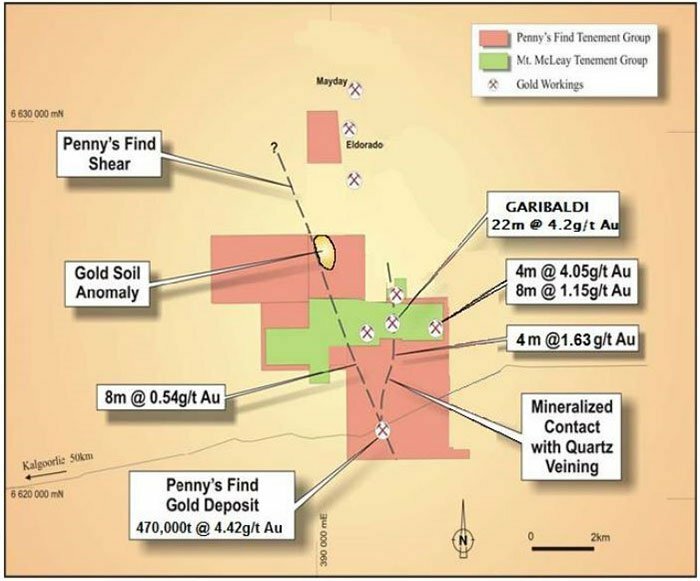 Further drilling at A Zone of the Yuinmery copper gold project should allow ERL should hopefully expand the total copper-gold resource base at Yuinmery. The Just Desserts prospect at Yuinmery already has an Indicated and Inferred resource of 1.27 million tonnes @ 1.9% Cu, 0.7g/t Au (based on a 1% copper cut-off). 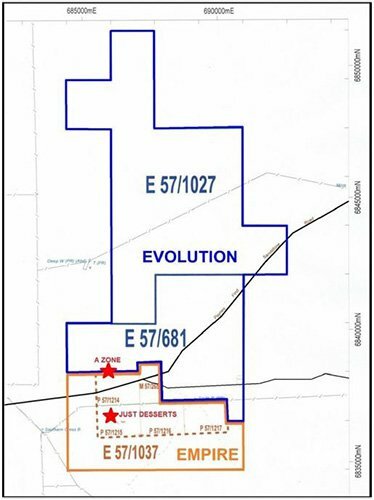 The A Zone prospect is just 1.3km along strike from ERL’s Just Desserts prospect, which should help streamline exploration and any future mining. The Option Agreement means that ERL have to meet all expenditure commitments while retaining an option to purchase Evolution Mining’s interest for either a cash or share consideration of $500,000. ERL appears to be well funded right now. In fact, the endorsement demonstrated in the recent A$2 million cap raise, and the A$7.5 million funding deal, show a far greater confidence from the market than where the company is currently valued. Beyond production, cash flow positivity would be the logical next major milestone for ERL – which would be a major achievement. Yet cash flow positivity is speculative at this stage and investors should seek professional financial advice for further information if considering this stock for their portfolio. ERL’s strategy is straightforward. Take advantage of a friendly macro environment, fast-track feasibility studies to extend the mine life, and begin gold production. ERL’s targets seem well within reach now and hopefully it shouldn’t be long before this small-cap generates its first gold bars... along with plenty of share price catalysts along the way.